I just got back from an amazing trip to New York City with some of my favorite girlfriends (coming soon to the blog). Even though I'm a California girl I think I left my heart in New York!! Shopping on 5th Avenue, eating the most incredible meals and seeing a great show made for the perfect getaway. But I am so happy to be back with my family and writing my blog!!! 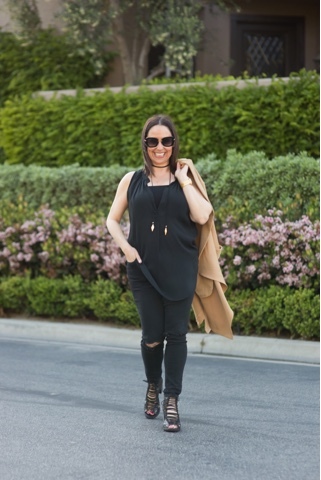 I wanted to share a hip new clothing line I was introduced to when I hosted the Nordstrom Spring Fashion Show at Fashion Island. It's called The Fifth Label. It is an Australian women's clothing brand morphing high fashion with bold street wear tailored for the modern era. What I love about this brand is that it takes a simplistic approach to modern silhouettes and concepts. This fashion line displays monochromatic themes that proclaim masculine details through a feminine presentation. This long duster jacket is from the Fifth Label. I love the color, length and fit. This piece was the main focal point of my outfit, so I added a black tank, distressed Topshop jeans, my Jeffrey Campbell shoes and this funky Vanessa Mooney necklace. I really am obsessed with this jacket and plan to wear it many different ways!!! I hope you check out The Fifth Label. I think you will love it as much as I do. Thanks to Gabi Wells for photos and Happy Reading !!!!! !